Over Spring Break I managed to come across some pretty cool articles and videos of innovative tech I hadn't seen before. I decided they would be pretty cool to share! The second one I found is a "Haptic Sensory Feedback" tablet prototype by Fujitsu. 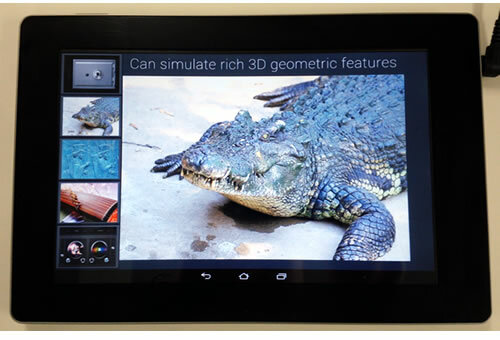 That is to say, it uses ultrasonic vibrations to simulate friction on a flat touch screen. That simulated friction can be used to recreate the feel of pulling on a harp string or touching an alligator's hide. It's some cool stuff! Pretty soon we'll probably be seeing scratch and sniff tablets as well!